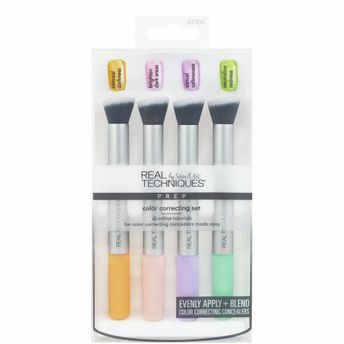 Make colour correcting easier with the Colour Correcting Set from Real Techniques. Apply, buff, and blend colour with the correcting concealers for an even tone complexion before makeup application. The brushes' colour coded handles make blending a breeze. Each brush and sponge in the Colour Correcting Essentials kit is colour coded to match their concealers. Lavender for cancelling sallowness, peach for concealing darkness, green to neutralize redness, and pink to brighten dull areas. Through Real Techniques, women all over the world are transforming their makeup routines, and themselves as well, with the approachable expertise, friendship, & expert tools from Sam & Nic. Real Techniques Collection is suitable for every makeup need from pressed or loose powders, creams and liquids to mineral makeup, highlighter and shimmer; the brush names clearly on the handles make for easy reference when creating your favourite look. Lavender brush sponge for cancelling sallowness. Peach brush sponge for concealing darkness. Green brush sponge to neutralize redness. Pink brush sponge to brighten dull areas.